In 1924 Van der Steur took up a post with Public Works as 'architect first class'. In the early years there he designed mainly school buildings, particularly in Rotterdam-Zuid. Features his buildings have in common include the use of brick, unusually shaped window units, large pitched roofs and striking entrance zones with pointed towers. Even the smallest buildings stand out in the city through their monumental conception and strategic position in their surroundings. 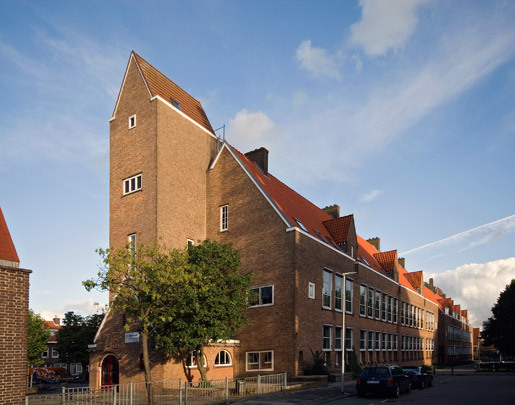 This school complex takes up an entire city block between Hoogvlietstraat and Heenvlietstraat. Other schools by Van der Steur can be found at Landmanstraat, Mare, Kameliastraat, Frankendaal, Kastanjedaal, Polderstraat, Putsebocht, Den Hertigstraat and Zegenstraat.